The armed man approached unsuspecting families outside the Mother's Day luncheon. 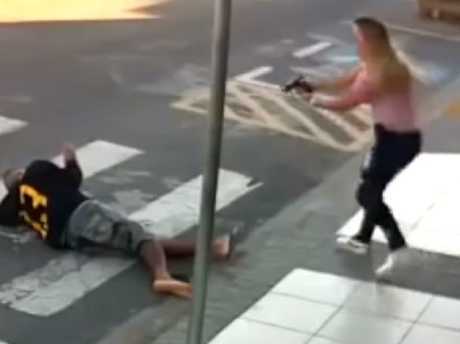 GUN violence is an unfortunate and terrifying reality in 2018, but one armed offender waiting outside a private school in Brazil's Sao Paulo met his match, when a mum literally stopped him dead in his tracks. 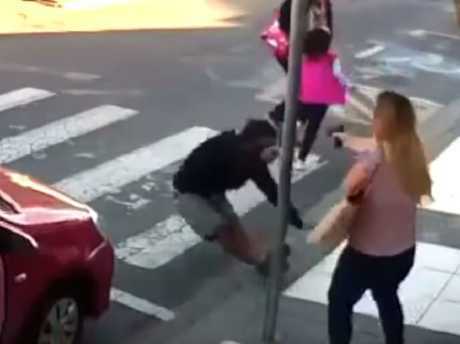 Katia da Silva Sastre, an off-duty military police officer, foiled the would-be robber's plan during a dramatic incident on Mother's Day and has been hailed a hero for her quick actions. 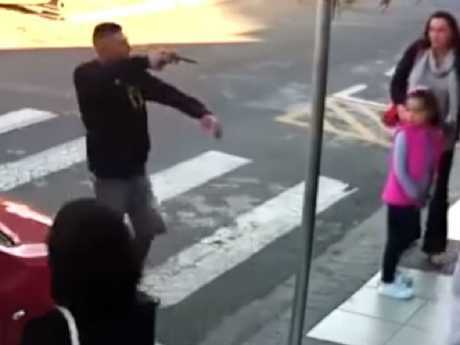 Security cameras outside the private school in Sao Paulo, captured the terrifying moment on Sunday when the offender, identified by police as Elivelton Neves Moreira, approached the school dressed in black and pointed a gun at unsuspecting parents and their children. Corporal Sastre, 42, was attending a Mother's Day luncheon at the school with her daughters, aged seven and two. She fired three shots into his chest and legs, causing him to fall to the ground. As Moreira, 21, threatened a school security guard and demanded he hand over his wallet, Corporal Sastre did not hesitate when she drew her firearm and stopped the offender, firing three rounds into his chest before he could act. 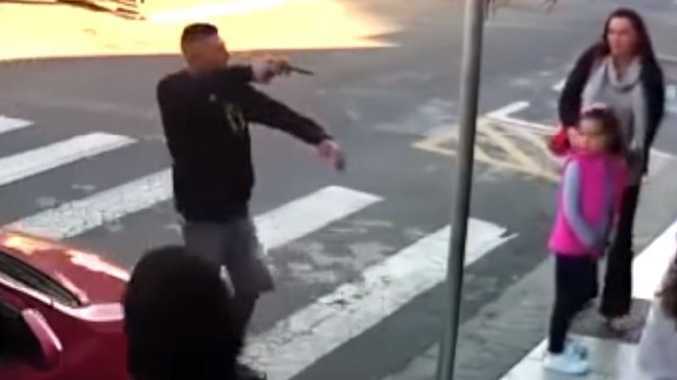 In the footage you can see the mother draw her police-issued firearm from her bag, load it, then swiftly approach the offender, firing three shots into his chest and leg. The armed offender fell back on to the road, firing two shots with one ricocheting off the ground and the other jamming in the chamber. The offender writhed in pain as the mother grabbed his gun and detained him. Corporal Sastre kicks the gun out of his reach and detains him in time for the police to arrive. "I didn't know if he was going to shoot the kids or the mothers or the security guard at the school door," she said after the incident. "I just thought about defending the mums, the children, my own life and my daughters." The man died later that day from his injuries. Corporal Sastre was commended for her bravery and was honoured in a ceremony by Sao Paulo Governor Marcio Franca on Sunday. 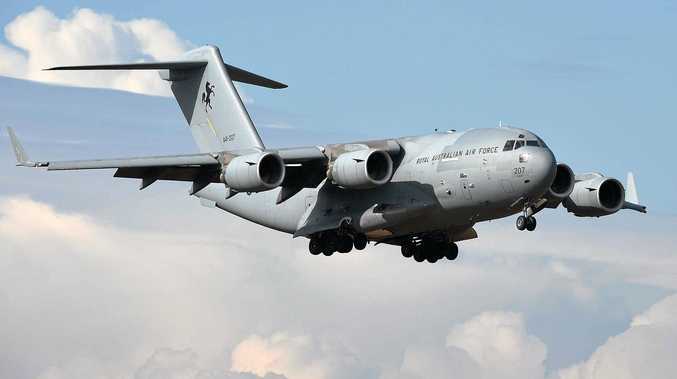 On Twitter, Governor Franca commended the mother, saying: "I went earlier to the 4th BAEP in the east of Sao Paulo to honour a very special mother: Corporal Katia Sastre. Her courage and precision saved mothers and children, yesterday at the door of a school." The Governor commended the heroic mum for her bravery and quick thinking. Corporal Sastre has served in the Brazilian military police force for 20 years and is also married to a police lieutenant. "She acted so precisely, so perfectly, that we decided to honour her," Governor Franca told media about the heroic Mother's Day act.